Seed-stage investing is attracting an increasing amount of attention from Canadian impact investors.1 At the same time, new accelerator programs tailored to the needs of seed-stage impact ventures are emerging across the country. These trends point to a growing interest in seed-stage impact ventures and their capital needs. However, to many entrepreneurs and investors, the seed-stage investment process is opaque, with no Canadian resources addressing seed-stage impact investing in Canada today. The Centre seeks to begin to fill that gap. Hard data is scarce in a nascent market, so we conducted interviews with market players to access their insights. This brief serves as a snapshot of the market in 2015. 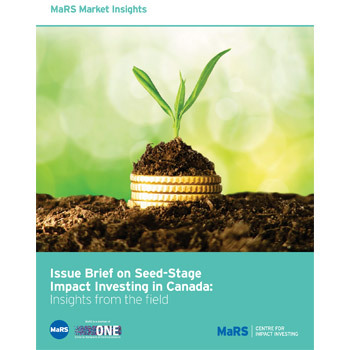 It summarizes what market players told us about seed-stage impact investing in Canada and offers insight into how, in practical terms, these investments happen. This paper is aimed at potential investors, entrepreneurs and capacity-builders who wish to understand how seed-stage impact investing works in Canada today.